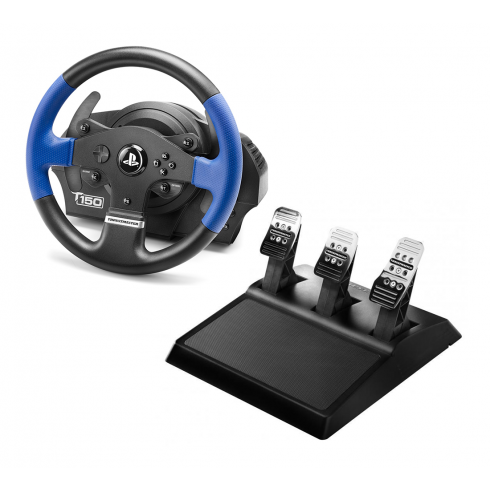 This is the new 1080° force feedback racing wheel and pedal set from Thrustmaster: T150 PRO! Pro Sim racers can now enjoy the quality of the Thrustmaster T150 Force Feedback wheel plus the highly-awarded three-pedal Thrustmaster T3PA pedal set as an added bonus. The Thrustmaster 150 PRO Force Feedback is the result of many years of experience and is the combination of advanced technologies. It is officially licensed for PlayStation 3 and PlayStation 4 and is also compatible with Windows. It’s a deal that racing dreams are made of; a complete racing simulation solution at an exceptional price! The wheel features reinforced rubber-coated grips and two large (5”/13 cm tall), 100% metal wheel-mounted sequential paddle shifters. The 1080 degree Force Feedback system consists of a mixed belt-pulley and gears system with metal ball-bearing axle. The T3PA 3-pedal pedal set has 100% metal pedals and internal structure. The 3 pedals are fully adjustable. For the most fun and realistic racing experience, you combine the Thrustmaster T150 PRO with a Playseat® racing chair! A rotation angle adjustable from 270 to 1080 degree allows gamers to race in all vehicles with unrivalled realism. The T150 is bundled with the three-pedal Thrustmaster T3PA pedal set, whose pedals and internal structure are all 100% metal. The T3PA is fully adjustable (spacing, angle and gas pedal with an adjustable height setting), and users can even adjust the push force independently for each pedal. The optional Conical Rubber Brake Mod is also included, allowing for an authentic feel with ultra-progressive resistance at the end of the pedal’s travel. Official racing wheel, ensuring automatic recognition by PS4 systems. The PS4/PS3 sliding switch ensures optimum compatibility with both systems. Can also be used on PC, thanks to Windows 10/8/7/Vista compatibility. Never take your hands off the wheel, thanks to the built-in official buttons (PS / SHARE / OPTIONS). Compatible with the Thrustmaster TH8A shifter. top for car's games: whit f1 2018 i drive very very fun!!! !